2014 Chevrolet Corvette Stingray – the New 1970s Trans Am? The Chevrolet Corvette has been America’s sports car since 1953. Only a few times over this long run has it had any competitors. And some of these times the competition came from an unexpected sources. One of these sources was from the American Motors Corporation (AMC), which was once America’s fourth largest automobile company that was formed from the merging of the Nash-Kelvinator Corporation and the Hudson Motor Car Company in 1954. Due to not having the development dollars that the big three automakers had, AMC was forced to focus on smaller more economical cars starting in the 1960s. AMC’s very popular Rambler was the company’s bread and butter in the 1960s. When the youth culture was influencing many of the new products from the big three automakers, AMC seemed unaffected by the trend. It merely continued to toil with what it did best – making reliable small inexpensive cars for their generally frugal customer base. After the runaway success of the Mustang showed the youth market was the auto industry’s golden goose, AMC could no longer turn a blind eye. 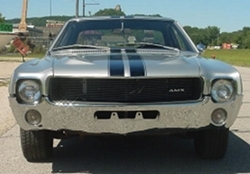 By 1968, AMC had its own pony car called the Javelin to compete with the Ford Mustang, Chevrolet Camaro, Pontiac Firebird, and Plymouth Barracuda. However the big news for 1968 was AMC was finally getting serious about changing its image by releasing a new 2-seat sports car to compete with the Corvette. Since AMC had a shoestring budget it kept its AMX development costs to a minimum by co-developing the 1968 AMX and Javelin on the same platform – in order to share many components and body panels. Both were 2-door cars that shared the same front-end and rear design. In fact both looked like twins with the exception of the AMX having a shorter 97 inch wheelbase and a length of only 177 inches. The Javelin on the other hand had a longer 109 inch wheelbase and a length of 189.2 inches to accommodate a rear seat. The AMX which was released in the middle of the 1968 model year was designed by famed AMC designer Richard Teague. It was a brilliant design that has stood the test of time, it was stylish with a semi-fastback design yet very muscular with blunt styling lines. This innovative styling made the AMX the attractive flagship car AMC had always wanted. Though the AMX was a shortened Javelin, it didn’t have a chopped look, in fact the styling could not have been more perfect. It was years ahead of the competition, it was an early glimpse of 1970s muscle car styling. AMC didn’t forget its customer base with the release of the AMX, it offered a lot of 2-seater sports car for the money. In fact so much so, it even had an ad campaign that showed the AMX as the only new American 2-seat sports car available for under $3,500. 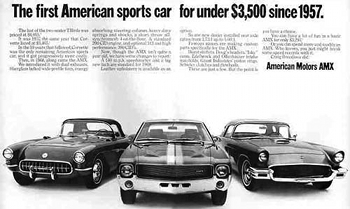 The ad which showed a new 1968 AMX in-between a 1957 Chevrolet Corvette and a 1957 Ford Thunderbird proclaimed the AMX as "the first American sports car for under $3,500 since 1957" (the AMX had a base price of $3,245). By comparison the 1968 Corvette had a base price of $4,320 for the convertible model ($4,663 for the coupe). This by no means meant that the AMX was a budget sports car, quite the contrary the AMX came standard with quite a few features including V8 power. Having standard V8 power was good news since the AMX had a very light curb weight of 3,097 lbs versus the 1968 Corvette which had a curb weight of a little over 3,500 lbs. The Corvette used light fiberglass body panels versus the AMX’s heavier steel panels – makes you wonder how much heavier the Corvette would have been with steel body panels. Standard was a 225 horsepower 4-bbl 290 CID V8 which could easily move quickly the light AMX. And for those looking for a little more punch there was a 280 horsepower 4-bbl 343 CID V8. And to prove AMC was finally ready to do battle with the big boys, there was a 315 horsepower 390 CID V8 on the option list which could give a strong showing against the 400 CID V8 equipped 1968 Pontiac Firebird, 396 CID V8 equipped 1968 Chevrolet Camaro SS, and 390 CID V8 equipped 1968 Mustang GT. Car Life magazine (April 1968) test drove a 390 equipped 1968 AMX and obtained a 0-60 mph time of 7.2 seconds and a (1/4) quarter mile time of 14.6 at 96 mph – times solidly in muscle car territory. AMX may have gotten into the performance game a little late but it caught on real quick to what performance buyers wanted. Dual exhausts were standard on all AMXs for 1968. And a floor mounted 4-speed manual transmission was also standard. 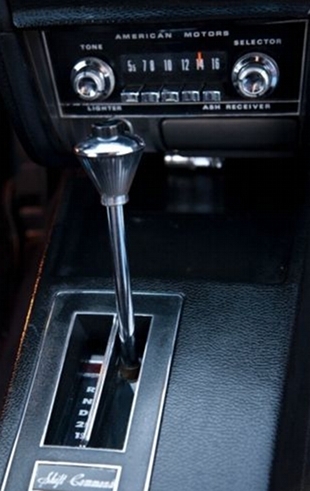 Optional was a 3-speed automatic transmission which when ordered was mounted in a center console. AMC also offered a performance oriented "Go Package" (sometimes referred to as the "Go Pack"). The Go Package which could only be ordered with the 343 or 390 V8 consisted of power front disc brakes, an upgraded handling package, a twin-grip rear axle differential, a heavy-duty engine cooling system, E70x14 red-line tires, and over-the-top racing stripes. To go along with its quick acceleration, the AMX was also a good handling car due to its standard tight suspension which included the following heavy-duty items: shocks, rear leaf springs, front coil springs, and front anti-sway bar. And when equipped with the upgraded handling package, the handling was simply superb. The upgraded suspension package (standard with the Go Package) gave as close to race track handing as you were going to get back in 1968 in a performance car. Compared to the standard AMX suspension, the upgraded suspension had stiffer shocks and stiffer front coil springs and rear leaf springs that gave it excellent handling characteristics. The Go Package’s power front disc brakes also enabled the AMX to stop in a much shorter distance than most 1960s era performance cars. The AMX came fairly well equipped at the base price, however just about every convenience and luxury option available on a upscale performance car could be ordered on the AMX. This includes items like air-conditioning, a state-of-the-art AM/FM radio/8-track tape player, and a tilt steering wheel. 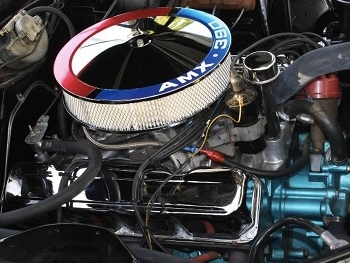 There were also other over-the-counter AMC performance options which could be installed at any AMC dealership – items such as Rally-Pak gauges, an aluminum intake manifold, and lower ratio performance gears – as low as a drag racing spec 5.0:1 rear axle ratio. 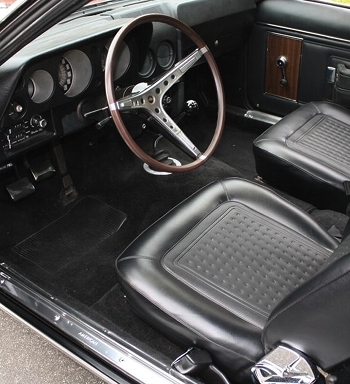 The AMX was certainly a big game changer for AMC, and nowhere was it more apparent than in the interior. The AMX could not in any way be mistaken for the type of budget cars AMC was known for producing before the AMX. The interior was modern and among the most stylish of its day. Bucket seats were standard. AMC to show how special this car was, placed in each AMX a metal plate on the dash above the radio, that had the production number engraved on it (there are rumors that some very early production AMXs left the factory without this plate). Also worth noting, AMC offered a Craig Breedlove edition AMX – approximately 50 were produced. It was the perfect tribute that AMC could pay to Breedlove, who had set many speed records with the 1968 AMX. All of these special edition cars were painted in red, white, and blue just like Breedlove’s racing spec 1968 AMX. It is believed that all of the Breedlove edition AMXs came equipped from the factory with the 290 V8 and 4-speed manual transmission combination. 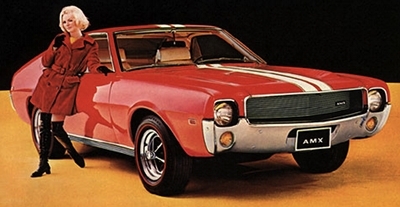 The AMX was a bold move, and it paid off for AMC – giving AMC solid performance credentials. The 1968 AMX sold much better than the 6,725 production total would have you believe. The first AMXs starting arriving on AMC dealership lots in March 1968 – giving AMC a very small window of a few months of AMX production. As a comparison the 1968 Corvette had a full year of production for 1968 and Chevrolet sold only 32% more Corvette coupes (9,936 to be exact) than the AMX. The 2-seat performance coupe market was still a small niche market back in 1968 so the AMX did much better than expected – convertibles had the popularity for 2-seater sports car buyers. A whopping 18,630 Corvette convertibles were produced for the 1968 model year. If given a full production year like the Corvette the AMX more than likely would have easy eclipsed 1968 Corvette coupe production. And who knows how high production numbers could have gone if AMC had offered an AMX convertible model. There’s no doubt that the AMX was a sign of good times ahead for performance buyers at AMC. The AMX brought youth buyers to AMC which was at the time a reassuring sign of future growth for the company. Unfortunately the party was short-lived – 2-seat AMX production ended at the end of the 1970 model year – after that the "AMX" just became a pseudo performance nameplate for other AMC models. As the 1970s rolled in, AMC soon had to come to terms with the 500-lb gorilla in the room which was the auto industry was drastically changing. Government regulations and the end of the muscle car era meant AMC had to carefully use their limited resources on their bread and butter economy cars. This reversion to the old AMC business strategy in the 1970s would kill the performance car at AMC. And as a result, interest in its cars would slowly evaporate throughout the 1970s. By the 1980s it worsened, even a partnership with Renault couldn’t revive AMC car sales. The end finally came when AMC was purchased by Chrysler in 1988 (a move done in order to get AMC’s Jeep division – which was the only part of AMC seeing skyrocketing sales). Sadly the last car to use the AMX name was the 1980 AMC Spirit AMX which oddly enough looked the performance part but unfortunately only had a 110 horsepower straight 6-cylinder motor under the hood. Fortunately this nightmare has been forgotten and the memory of the original 1968-1970 AMX lives on among muscle car enthusiasts. The real sad story in the AMX saga is that AMC with the AMX offered a true 2-seat performance car that could be purchased by any buyer who couldn’t afford a Corvette. After the original 2-seat AMX production ended, never again would America see a performance package in V8 powered 2-seater that the average Joe could afford. Upon reflection this is a very sad thought – the 1968 AMX is sorely missed.